My first night in Arkansas was spent at the Robinwood Bed & Breakfast, a lavishly restored home in Little Rock's Quapaw Quarter. 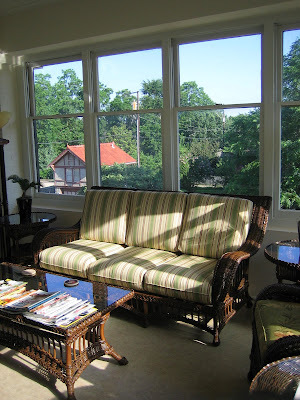 My favorite rooms were the two large sunrooms. Here's the upstairs one, which is stocked with magazines. As my previous post demonstrates, my camera got a lot of use during a stroll around the inn's stately neighborhood. Every other house merited a snapshot, so I eventually had to reign myself in. There weren't just a few gorgeous historic homes. It was one of the largest collections I've ever seen. Then I came to find out the The Quapaw Quarter is nine square miles! How big is that? Well, it's nearly half the size of Manhattan, which is 22 square miles. No wonder the historic district seemed to continue block after block as far as you could see. According to the Quapaw Quarter Association, which works to preserve historic buildings and organizes bi-annual home tours, there are over 250 National Register properties in Greater Little Rock. Most of the homes were built between 1880 and 1920, and they represent primarily Colonial Revival, Queen Anne and Craftsman architecture. The Robinwood hails from around 1913 and stands out as one of the rare examples of Prairie architecture, as championed by Frank Lloyd Wright. Not only did our stay at the B&B introduce me to this amazing neighborhood, but it was a delightful experience in and of itself. High-end luxury for $135/night. Believe it. I was so smitten that I was compelled to write this effusive review at TripAdvisor.com, a site I use religiously when researching lodging. I must say that it was an auspicious start to my time in Arkansas. 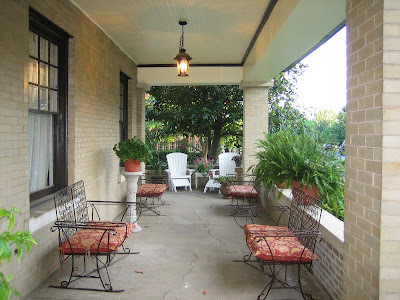 The Robinwood has a great porch (see the photo below), and as you know from my last post, that gives me butterflies.